In Fort Worth, most of the homes with septic systems are either a bit outside of the city or on a good piece of land, many homeowners do not put much thought into keeping their septic system healthy. A septic system that has been used for many years without maintenance is a ticking time bomb. Neglect can lead to a variety of issues, most of which can decimate your septic system. Along with inspecting your system regularly, your tank needs to be pumped and cleaned on a regular basis. The rule of thumb is generally to have the tank pumped every three to five years but that can depend on the use that a system is receiving. B&B Pumping is proud to be part of the Fort Worth, Texas business community. We understand that your septic tank is not the first priority and many times the system is not pumped until it absolutely must be done. In many cases we can pump your tank the same day that you contact us! If it has been a long time or you can’t remember when your tank was pumped last, please give us a call and we will inspect and pump if necessary. Get That Tank Pumped Now! When you need to depend on a septic system for your home it is critical that everything is working correctly. The septic tank is basically a biological process that requires a variety of bacteria and microorganisms. The bacteria is in charge of breaking down the waste and keeping the tank from filling to quickly. As simple as it sounds this process is incredibly delicate and can be affected by what is put down the drain. Using certain toxic cleaning products can actually sterilize the bacteria in your tank and lead to a faster accumulation of waste. 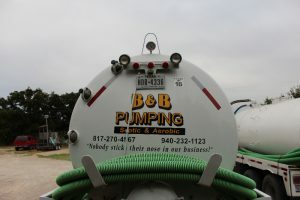 Don’t Wait, Call B&B Pumping, Fort Worth Today! Whether you have an aerobic or a conventional septic system, keeping up with the maintenance is critical to the health of your system. If you live in the Fort Worth area please give us a call and let us take care of your septic system!